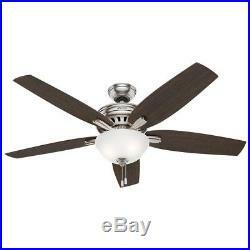 Hunter 56 Great Room Ceiling Fan in Brushed Nickel with Bowl Light Kit. Savings Without Sacrifice Hunter combines 19th century craftsmanship with 21st century design and technology to create ceiling fans of unmatched quality, style, and whisper-quiet performance. Using the finest materials to create stylish designs, Hunter ceiling fans work beautifully in todays homes and can save up to 47% on cooling costs! Through its casual style and charming appearance, this fan will compliment your décor without overpowering it. Clean line details work together throughout the fan body, blade irons, and bowl light kit to create a coherent design with wide appeal. Brushed nickel finish with 5 medium walnut / dark walnut reversible plywood blades included. Includes bowl light kit with cased white glass and two 13W standard medium base CFL bulbs. Installer's choice three-position mounting system allows for standard, angled or low ceiling mounting. 3" and 2" downrods included to ensure proper distance from the ceiling and optimize air movement at your preferred blade height. 13 degree blade pitch optimized to ensure ideal air movement and peak performance. Included pull chain allows for quick and easy on/off and speed adjustments. This Ceiling Fan operates on standard US 110 volts. For International customers please consult with an electrician before ordering. The item "Hunter 56 Great Room Ceiling Fan in Brushed Nickel with Bowl Light Kit" is in sale since Monday, February 26, 2018.